One of my favorite cheap foods is homemade pizza. 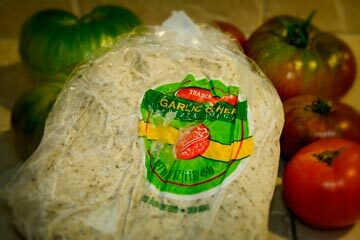 The herb dough from the refrigerated section of Trader Joe’s is great and you can freeze it until you are ready to use it. Just let it thaw out for about a half hour and then spread it thin for the crust. The instructions don’t tell you to do this, but if you pre-cook the crust for 5-7 minutes before putting on the sauce and toppings, the pizza turns out WAY better. If you don’t, it can be kind of mushy. Especially when you like to put on a ton of different toppings like i do. You can also find pizza dough at local bakeries and pizza shops, so happy shopping! ALDI: Oh the efficiency of getting cheap food! Narrowing down where to shop for cheap food is a necessity when you are trying to be efficient and save money on groceries. Most people are saying to buy the generic brands, but others are saying clip coupons. I have found that coupons on brand names are almost always still more expensive than buying generic. But, there may be professional clippers out there that have found a way. On the other hand, ALDI is a great place to go for cheap wine (hooray for Winking Owl Cabernet!!) 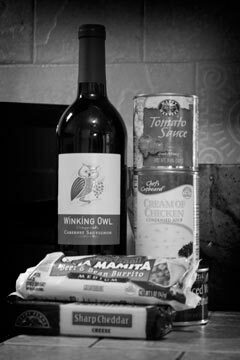 and the basics of cooking like olive oil, flour, snacks, etc. But, you can’t overlook the hidden surprises. I say hidden because everything is kind of a free-for-all but knowing where the goods are is the key. For example, there are $0.35 boxes of macaroni and cheese (it is the powdered kind, but still if you are buying this stuff anyway, holy Christmas! ), a three-pack of bell peppers (red, green, orange) for $2.75, and frozen beef and bean burritos for $0.30 each. Mostly everything is cheaper than in the grocery store, but you can’t count on finding everything you need at ALDI. Cheap food, yes. Gourmet food, no. Oh and I couldn’t forget the amazing way they do checkout. They ring your items up and put them all in another grocery cart to bag/box yourself in another area. This REALLY speeds up the process. Plus, they encourage you to bring your own bags by charging you for paper and plastic ones. Brilliant; I love it. I thought I should start my blog off with a topic I can’t stop talking about. 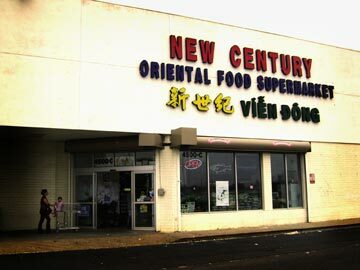 I am on a strict budget these days, including groceries, and one place I frequent is the local Asian Food Market called New Century Grocery and Food at Tryon and Sugar Creek. This place is enormous and overwhelming, confusing and exhilarating. They don’t have the place set up in an order you or I would be used to, for example, it might makes sense for all the stuff for making sushi to be together, but it is really spread all over the giant store. So, your first trip is a bit of an exploration but, when you do finally find that box of jasmine tea for $0.50 and a 10lb bag of long-grain rice for $7.99, you’ll never forget where it is on subsequent trips. They also have a great, cheap produce section for general items like bell peppers, chili peppers, garlic, cabbage, etc that are at great prices. They have a great selection of edemame and frozen dumplings of every shape and filling. Don’t be distracted by the huge freezer section of fish balls (what exactly does that mean anyway?) or the fresh meat section featuring tripe. Mom, I have still not disobeyed your order to NEVER eat tripe. I know, you’re proud of me. There are wonderful treasures to be found and the search is half the fun. However, once you shop there a few times, you can limit your trip time by knowing where to go to get your regular items. The moral of this grocery story, if you are looking for cheap food and a little adventure, check out your local Asian food market, New Century if you’re close to Uptown Charlotte.